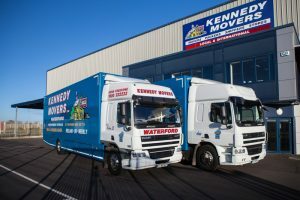 Kennedy Movers are specialists in removals from Ireland to Europe. We cover the whole of Europe and Eastern Europe by road. We are a specialist European Removal Company with years of experience in providing a first class and cost effective service to Europe. We operate services from Ireland and the UK including the Scottish Islands, the Isle of Man and the Channel Islands. We offer private and corporate removals as well as a trade service. We are recognised as one of the leading specialists in European door-to-door removals, with many years’ experience. We can deal with either full- or part-loads; you can trust us to transport your goods safely, anywhere in Europe. We can provide a tailored removal service to meet your every need. All our vehicles are fitted with satellite tracking, in-cab telephones for minute-by-minute monitoring and first class security. With our vehicles frequently in Europe, if you’re moving back to Ireland or the UK we can collect your personal effects at a very competitive rate. All our packing crews are fully BAR trained in overseas packing (export packing) and have vast knowledge in packing all types of items, such as Pianos, Grandfather Clocks, Antiques and Artwork. For smaller consignments our part load service to Europe is the perfect answer, and consists of your effects being packed (if required) and removed from your current residence, and taken to your new home abroad with other customers effects on the vehicle all sharing the transportation costs. Each customers’ effects are itemised, colour coded and inventoried to eliminate the possibility of mistakes. The removal crew will provide you with a copy of the inventory for a cross reference at destination. A part-load service requi res you to be flexible with your dates for collection and delivery as you are sharing the vehicle & costs with other customers. Price is based on when we have a vehicle passing your postcode area of residence. Please advise us of your dates and we will endeavour to meet them on a part-load service to Europe. Our dedicated load/express service to Europe consists of your effects being packed (if required) and removed from your current residence, and taken directly to your new home abroad with no other customers’ furniture on the vehicle. Wherever possible we utilise the same relocation operatives who loaded the vehicle to unload and unpack at destination. Our dedicated load/express service is only limited by the confines of driving (Tachograph Digi Tacho Laws) and your sale/purchase dates. We guarantee to meet your preferred delivery date on this service except for circumstances beyond our control (e.g. UK industrial action, adverse weather). Some customers, on occasion, fail to inform us about access restrictions to their new property. All factors need to be taken into consideration, all access roads need to be wide enough for a removal vehicle or the road could be too steep for a large vehicle or there could be many stairs or alleyways into your property. We can assist with difficult access in Europe by utilising our network of local removal companies who can offer manpower and small vehicles for trans-shipment if required. PLEASE ADVISE YOUR MOVE COORDINATOR OF ANY DIFFICULT ACCESS TO YOUR PROPERTY ABROAD.